Councillors, along with the Chief Executive joined Minister for Regional Economic Development, Hon. Shane Jones in Methven last Friday (15 February) for the announcement. The $7.5 million Provincial Growth Fund loan will support the Opuke Thermal Pools and Spa development underway in the Mount Hutt ski town. "This funding will provide an enormous boost to the Opuke Thermal Pools and Spa, helping to grow our local economy and support even greater year-round tourism in Methven and the district at large. ​​ We are thrilled with the announcement and are very excited for the opportunities this will open up for our district and the wider Canterbury region," Chief Executive Hamish Riach said. 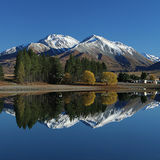 Hutt ski area, this funding will really help to seal Methven's place as a top tourism destination and choice of place to live," she said. The Opuke Thermal Pools and Spa will be the first of its kind in New Zealand to be heated by solar power and produce no emissions. Mayor Favel added, "The Methven community has demonstrated a great strategic mindset in searching for future economic benefits. EA Networks Centre upgrades a win for local sport groups It’s a world-class facility that attracts regional and national competitions, and now Ashburton’s EA Networks Centre stadium can open its doors for even more business, courtesy of a clever curtain divider. The new retractable curtain was installed at the Centre in January, which - combined with the original curtain, allows the stadium to be split into four separate court areas. The addition means different sporting codes can be played on the courts at the same time without interfering with each other. “This opens up a lot of opportunities for the EA Networks Centre. It’s a popular venue for a lot of local competitions and larger tournaments, so being able to safely host more of them at the same time is a great use of the space and better convenience for our users,” Sports Facility Manager Steven Prescott said. “Pools like ours are regularly used all year round, so we have to do some maintenance to keep them in tip top shape. We replaced some broken tiles and re-grouted three of our four pools, replaced some flooring and changed some of the doors in the changing rooms to aluminum ones,” Steve said. The maintenance work meant the pool facilities had to close for two weeks in January, however with the availability of more outdoor pools over the summer holidays, swimmers had a number of alternate venues to cool off in. 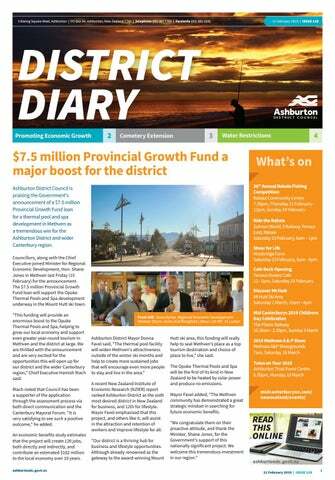 How we promote economic growth - Chief Executive Ashburton District undoubtedly has a competitive edge for business, and our ability to attract and retain investment in our district has great flow-on effects for our local economy. A recent New Zealand Institute of Economic Research (NZIER) report found that our district is actually the sixth most desired one in New Zealand for business. We are optimally located along State Highway One; within close proximity to Christchurch; with rail, airport and shipping port facilities all within reach. As a Council, we’re very excited to see our business community thrive. We also play an active part in helping to support its growth. In fact, one of the Council’s main contributions to furthering investment in our district, is the Ashburton Business Estate that we developed and continue to manage on the north-eastern side of Ashburton. Holdings; WaterForce; NPD Fuel Stop; Canterbury Long Run Roofing; Fineboon – NZ Dairy Collaborative; Cullimore Engineering; Skip-2-It Flooring Xtra; Fonterra; Replas; Midlands; Midlands Apiaries, Lemacon, Mainland Coachworks Ltd; Active Print & Production, Sebco; and Plains Irrigators also call the fully serviced estate home, and interest in the estate is still continuing. The 80 hectare commercial and industrial development was officially opened in 2011, providing long-term, sustainable property options that support the enormous potential of our fast-growing and progressive district. Our hardworking Commercial and Property team are able to work with businesses to find the right solution for their requirements, whether they wish to design and build, or build and lease back. We can also customise the size and shape of the sites to meet specifications, and to top it off, the Ashburton Business Estate has some of the lowest industrial-zoned land prices in the region. Councillor Comment The dry weather has certainly settled into Mid Canterbury, and water restrictions are now in place across all water schemes in our district. The wet weather we experienced in spring saw a spike in growth, and coupled with our now hot and dry conditions, it’s important for everyone to take precautions to minimise the risk of fire. As we’ve intently watched the bushfire events unfold in Tasman, we’ve seen just how quickly fires can start and spread. restricted fire season and a total fire ban for the Ashburton Coastal and High Country zones, respectively. This means, depending on your location, a permit is needed before you can light an open air fire, or they are prohibited altogether. Even with these preventative measures in place, unfortunately accidents can still happen. How do our services rate? a suitable place to extend the current one,” Ashburton District Councillor Stuart Wilson said. As Chair of the Council’s Service Delivery Committee, Cr Wilson’s portfolio includes overseeing 11 of the district’s open cemeteries and five closed ones. “The proximity of the extension ties in well with the current cemetery and allows people to be able to visit their loved ones from one site, rather than a disjointed facility spread across different areas of town,” he continued. Cr Wilson agreed: “The weather has been quite optimal and they’ve [ACL] got in and made a real go of the project. We’re very pleased to see local contractors being used for such an important piece of work for Ashburton.” ACL and other local subcontractors are set to complete the project on time in April. The $1.5 million extension will include a natural burial site, a cremation and ashes scattering area, as well as a traditional grave site. ACL began earthworks this month. They are upgrading the existing access off Seafield Road and will be constructing a new access way into the new extension, complete with entrance gate and walls. The internal roads and car parking will be sealed, and a water reticulation system will be installed throughout the site. Internal stormwater reticulation soak pits will ensure the site is kept adequately drained. Last chance to ‘Art the Park’ The Ashburton skate park is getting a new coat of paint featuring the talented creations of Christchurch street artist, Wongi Wilson, and locals have one last chance to see their ideas included in the work. Residents are being asked how they think a range of Council services and activities are performing as part of the Ashburton District Council’s Annual Residents’ Survey. The survey is being conducted by independent Canterbury-based company, Research First who are phoning residents (both landlines and mobile phones) to complete the survey until mid March. “The design is quite smart and allowsfor some contingency if particular types of remembrance options go in and out of favour,” David explained. To enter your ideas, simply draw or write your answer to the question ‘what does our district mean to you’ on an entry form at the Ashburton Art Gallery by Friday 1 March, 2019. The new street art will be revealed at a launch on Saturday 13 April at the skate park, located on West Street, Ashburton, opposite McDonalds. Christchurch’s Cheapskates Skate Skool will be on hand holding a skate jam at the launch. Ashburton District Council and Safer Ashburton are working together on the street art initiative. Resene ColourShop Ashburton will be donating the primer paint for the project. a gold coin donation and the giant chess pieces will be out for people to have a game. The Weird and Wonderful Ways to Waste Time Map Relaunch event will be at the Ashburton checkerboard, East Street from 12pm-1pm on 1 March. See the Ashburton Youth Council Facebook page event @AshYouthCouncil for more details. Water restrictions now in place across district Water restrictions are now in place for all Councilsupplied water schemes in the Ashburton District. For schemes not on a permanent restriction, the restrictions mean residents can only use a hose, micro-spray or automatic irrigation system on alternate days and - in some areas, during specific time periods, to help conserve water. "The Water Restriction Policy ensures conservation of water to even-out demand. This enables residents to continue to enjoy reasonable use of water for gardening and nonessential purposes," he added. To find out what restriction level your water scheme is on or for further information on conserving water, please visit ashburtondc.govt.nz/ waterrestrictions. This webpage is regularly updated with scheme restriction levels. The restrictions will remain in place until further notice. "In summer, exceptional demand for water can sometimes limit the water schemes' ability to consistently deliver water to all properties at the required pressure," Council Service Delivery Group Manager Neil McCann said. Some plumbing fittings have potential for minute traces of metals to Period of Closure: accumulate in water that has been in the fitting for several hours. From 6am until 4pm on Sunday 24 March, 2019 Although the health risk is small, the Ministry of Health recommends you run a mugful of water through your drinking water tap each morning before use to remove any metals that may have dissolved ​ ny person objecting to the above proposals should lodge notice of A from plumbing fittings. their objection and the grounds for their objection in writing by post We recommend this simple precaution for all households, including or email to the Council, 5 Baring Square West, Ashburton by 4pm, those on public and private water supplies. Friday 22 February,​2019. This notice is issued by Ashburton District Council on behalf of the Neil McCann Group Manager Service Delivery Director - General of Health, Ministry of Health. Ashburton District Council gives public notice of the following proposals to temporarily close roads to ordinary vehicular traffic. Ashburton District Council gives public notice of the following road closure to ordinary vehicular traffic. The above two meetings are held in the Mt Hutt Memorial Hall Methven Board Room at 160 Main Street, Methven. From 7.30pm, Friday 10 May, 2019 until 8pm, Sunday 12 May, 2019​. Detours will be available on adjacent streets and these will be signposted. The proposed closure is made under the Local Government Act 1974 - Schedule 10 (11 (e)) and will be considered at the Service Delivery Committee Meeting on 21 March 2019. It will be an offence under the above regulations for any person otherwise than under authority of an authorised permit to use the roads for ordinary vehicular traffic during the period of closure. Environmental Services Committee Thursday 21 March, 1.30pm Service Delivery Committee Thursday 21 March, 2.30pm (approx.) Finance and Business Support Committee Thursday 28 March, 1.30pm All meetings are open to the public unless otherwise stated. Meeting start times may be subject to change and will be notified on Council’s website.